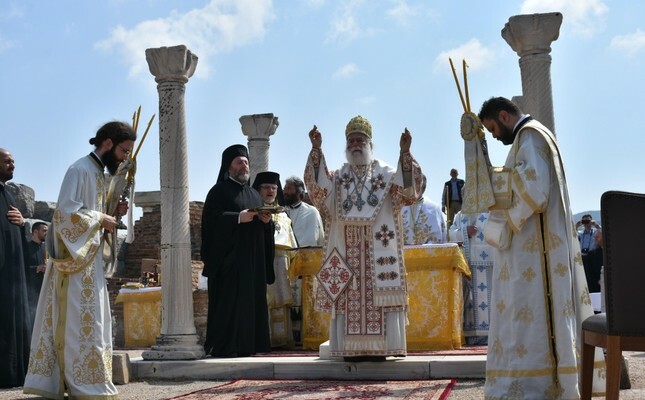 Patriarch Theodore II of Alexandria presided over the service held at the ruins of St. John Basilica, May 9. Orthodox clerics and Christians from across the globe came together yesterday in western Turkey's Selçuk for a religious service in remembrance of Apostle John, one of the 12 disciples of Jesus, who is better known for his Gospel of St. John. Fener Greek Orthodox Patriarch Bartholomew I, whose patriarchate is based in Istanbul, backed out of the event due to an unspecified illness. Theodore II, Orthodox patriarch of Alexandria in Egypt, presided over the service. Bartholomew I is the spiritual leader for millions of Orthodox Christians around the world while Theodore II is the religious leader for a number of Orthodox churches in Africa, from Egypt to South Africa. Among those attending the solemn event in the town that was part of the original site of ancient city of Ephesus were Greek diplomats stationed in Turkey, the Orthodox Christians from other Turkish cities, bishops from Orthodox churches in İzmir - the Aegean province where Selçuk is located - and bishops from Belgium. In a speech in Greek on the sidelines of the mass, Patriarch Theodore II said he was honored to lead the liturgy. "I am grateful to Patriarch Bartholomew for his hospitality and permission to lead [the liturgy]," he said, adding that praying in St. John's Basilica had a significant place in their faith [because John is believed to have died there circa A.D. 100]. Following the liturgy, participants visited Şirince, a district of Selçuk where another old church dedicated to St. John is located. Feast Day for St. John is more than a religious event and opens its doors to people of other faiths as well as cultural events on the side. The "Migrating Birds" concert that was held on May 6 was one of them. The Istanbul Zoğrafyon Greek High School choir and "Domestiki" chorus from Greece's Drama performed Turkish and Greek songs in a concert at the İzmir Sanat culture center. St. John Basilica, where the religious service is held, was built by Emperor Justinian in the sixth century in Ephesus. Every year, a large number of tourists from around the world visit Ephesus to see the church, which is second most-visited place in its immediate region after the ruins of the ancient city itself. The basilica is a pale shadow of its former self despite multiple restorations with only remains of the outer walls and some columns intact. Still, it is a main attraction for Christian pilgrims. Stepping on its still-standing marble steps by the surviving monumental gate is enough to awe them. It is located on top of a hill where the "assumption" of the apostle took place. A marble slab marks the tomb of St. John although his relics were not found after his death according to the legend. İzmir has recently seen a revival of the Greek Orthodox community with renovation and reopening of churches after being in a state of disrepair for years. The city had a significant Greek population before a population exchange in the 1920s between Turkey and Greece that saw the majority of the community leave. The third-largest city of the country was once known as Smyrna and a center for the first Christian communities of ancient Turkey. It was in Ephesus that the 3rd Ecumenical Council that would shape today's Orthodox Christianity was held.